Tiny feet and hands. It’s what the early childhood community thinks about each and every day. Unfortunately, these tiny feet and hands are not always warm and comfortable. Today, through outreach and policy efforts, there is an increased awareness that homelessness affects families, and families with young children and an increased understanding of the impact that homelessness has on families and especially on young children. We also have a deeper understanding of the important role various systems can play to prevent and help end homelessness among these young children and their families. Estimates show that there are more than 1.2 million children under six experiencing homelessness every year. These children sleep in cars, shelters, and abandoned buildings. Their families relocate often, which results in infants and toddlers having little continuity of care. Current research establishes a strong connection between a young child’s early experiences and the development of his or her brain structure. 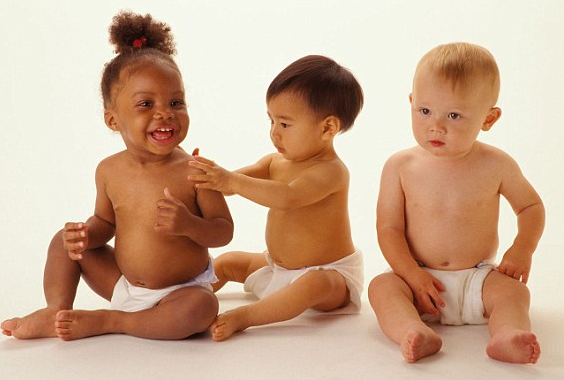 These early years of life can provide a strong or weak foundation for all future learning, behavior, and health. Children born into homelessness are more likely to have low birth weights, are at greater risk for multiple health risks, and have greater experiences of food insecurity. Study after study confirms what every teacher knows: young children who experience secure, stimulating environments with rich learning opportunities from an early age are better prepared to thrive in school and in life. Increasing access to and the quality of services for families experiencing homelessness is an ACF priority, as demonstrated by the integration of homelessness outreach into many of our programs and the recently-released Joint Policy Statement on Meeting the Needs of Families with Young Children Experiencing and At Risk of Homelessness from the Departments of Health and Human Services (HHS), Housing and Urban Development (HUD), and Education (ED). We know that quality early childhood services can provide important stability and continuity during these difficult times. It is why both the Improving Head Start for School Readiness Act of 2007 and the Child Care Development Block Grant Act of 2014 (CCDBG) have special provisions for serving children and families experiencing homelessness. In September, two new rules were issued by the Administration for Children and Families (ACF). The first was the new Head Start Performance Standards (HSPPS)—the first comprehensive revision since the standards were originally published in 1975. The new Standards reflect current research, science, and best practice. They describe high-quality service delivery so Head Start is better able to focus on outcomes for children and families. They reduce administrative and regulatory burden and improve clarity and transparency. These new standards also help programs better serve children experiencing homelessness in their communities by encouraging the use of tools like the community needs assessment, providing a grace period for families experiencing homelessness to meet immunization requirements, and having the ability to reserve up to three percent of slots for foster children and children experiencing homelessness. Head Start directly serves children experiencing homelessness from birth to five years old and provides children and their families with services related to nutrition, developmental, medical and dental screenings, immunizations, mental health and social services referrals, and family engagement. At the end of September, ACF also released the final rule that makes the necessary regulatory changes to the Child Care and Development Fund (CCDF) in light of the 2014 reauthorization changes. The final rule clarifies that children experiencing homelessness shall be given priority for services, specifies that a grace period be established in consultation with an appropriate health agency and requires lead agencies to coordinate with other agencies to help families receiving services during a grace period to comply with immunization and other health and safety requirements. 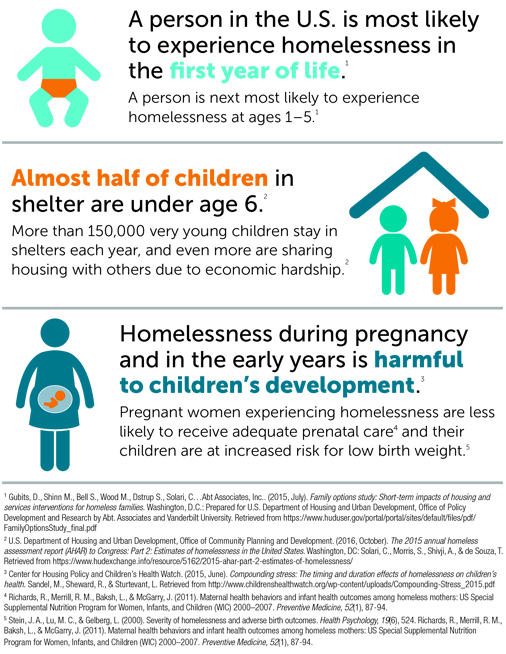 An infographic published with the Joint Policy Statement shows that, in the United States, infancy is the age at which individuals are most likely to enter shelter or transitional housing, followed by ages one to five. The Policy Statement highlights avenues and models for partnerships between early childhood education and care providers, schools, communities and housing providers to work together to transform that reality for children and families and to ensure that these children are safe and stably housed and connected to education and care. With more and more attention being paid by each of us toward preventing and ending family homelessness, it is our hope that someday all tiny hands and feet can be warm and comfortable. Marsha Basloe is a Senior Advisor for the Office of Early Childhood Development under the leadership of Deputy Assistant Secretary Linda Smith at the Administration for Children and Families, U.S. Department of Health and Human Services.